Back in July 2017 I reviewed the Traser Aurora GMT which was a great little watch and is so perfect for the world traveler. I really love a good tool watch and I tend to be partial to larger watches, so when this Traser P68 Pathfinder came along I was very interested. The most interesting part of this is the tool that it has. It can be used as a compass. Yes, you can use a watch as a compass. Lets check this out and see how its done. In my opinion this is one of the most appealing dials I have seen. There is a lot going on but it does not look cluttered. Indoors the blue face takes on a nice dark tone but when the light hits it, the sunray finish totally pops. The inner rotating bezel is marked with compass directions and really looks cool. Covering all of this is a large scratch-proof sapphire crystal with AR coating. For a simple three handswatch this dial is anything but simple looking. This watch is powered by a Swiss automatic movement which is probably an ETA 2824 or Sellita SW-200. Both are very good reliable movements. As I mentioned I really like larger watches. Anything up to 48mm works for me. This Traser P68 Pathfinder measures in at 46mm so that’s just perfect. Thickness is 12mm. The case is stainless steel with black coating, matte with polished details. Both crowns are screw-down. Weighing 126g, this watch is large but not heavy. Water resistance is 300ft which is fine for a non diver. The finishing on this case is great. There are no imperfections anywhere. 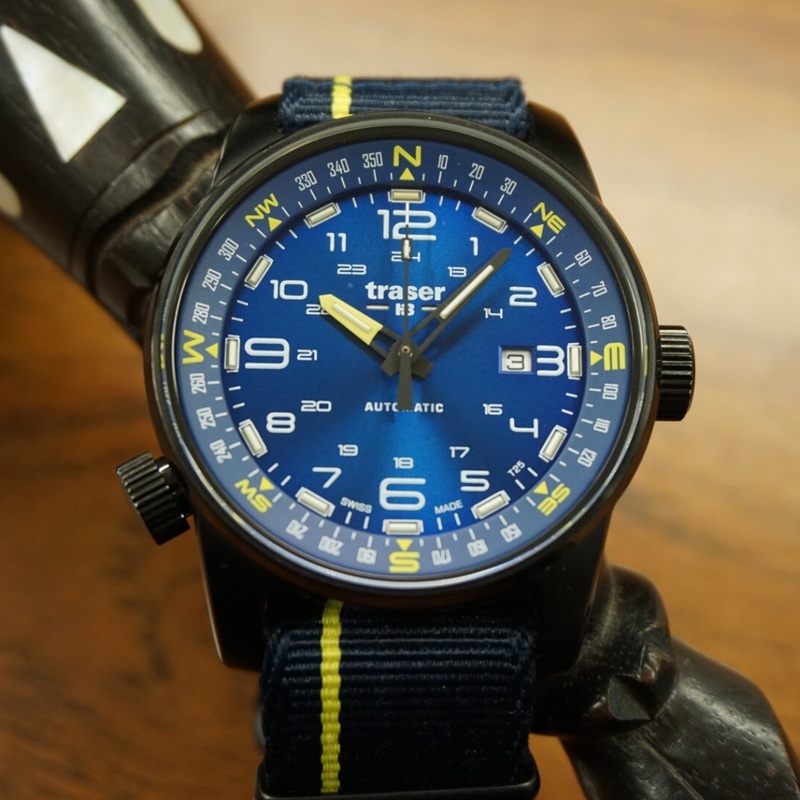 The Traser P68 Pathfinder comes with a nice Nato strap. I wore this watch for a week straight while traveling to Austria and had no issues with comfort at all. This strap is just the right thickness to provide support while not feeling too bulky. The yellow accent looks great and pairs with the watches dial. Traser uses three types of lume! They use a combination of trigalight® (tritium tubes) for the hours indexes and hands, Superluminova for the dial, and a luminescent glass seal. This combination creates such a fantastic glow. Even when the Superluminova and luminescent glass seal fade there will still be a glow coming from those trigalight® gas tubes. So, alittle about trigalight®. Trigalight® are tiny glass vials filled with tritium gas, which is an isotope of hydrogen. These vials are coated with a phosphorescent paint which react with the tritium gas. This reaction create a nice glow that can last up to 25 years. Pretty darn amazing. Well its not a compass with a little floating needle that reacts with the earths magnetic field but it can tell you which direction you need to go. Instead of using the earths magnetic field to get your bearings, you will need to use the sun. Using this is actually pretty simple. First what you need to do is point the hour hand to the position of the sun. Next bisect the distance between the hour hand and the 12 o’clock hour maker to determine south. Rotate the bezel to that point and now you know what direction you need to go. Only drawback of course is that this will not work on a cloudy day, or at night, but its still a cool tool to have when going on an adventure. This Traser P68 Pathfinder for sure has the cool factor going on. The dial looks fantastic and the build quality is excellent. Whether you are going to use the compass feature or not, its still cool and fun to talk about. This watch went to Austria with me for a week and was perfect for my trip. No issues at all and I actually did try the compass feature, for fun. For $922.50 USD this is a pretty good price for all that you get. If you like it go check it out at traserwatchesusa.com. The best thing about it: Its a compass!